Dominic Thiem and Jo-Wilfried Tsonga advance at the Erste Bank Open on Tuesday while Feliciano Lopez and Jurgen Melzer upset a pair of seeds. Jurgen Melzer will be out for nine months and will miss the 2016 Rio Olympics following surgery on his left shoulder. Melzer, who hasn't played since the U.S. Open, has been struggling for years with persistent shoulder problems. The 34-year-old lefthander said on Friday "after three months of conservative treatment I've decided to have my torn labrum arthroscopically repaired." Iveta Benesova has become a married woman as she tied the knot with fellow tennis player, Jurgen Melzer. The couple started dating in 2011. They played mixed doubles at Wimbledon that year and they won the title. Melzer posted on Twitter a picture of the marrie couple announcing the news. WTA Tennis Player, Michaella Krajicek, also posted a picture from the wedding. On day 2 at the Monte Carlo Masters 2012 Fernando Verdasco, Jurgen Melzer and Alexandr Dolgopolov were among the first round winners. Verdasco beat Olivier Rochus 4-6, 6-2, 7-5 and will next play Ivan Dodig. Dolgopolov defeated Juan Igancio Chela 6-2, 6-2, setting up a match against Bernard Tomic while Melzer downed Lukasz Kubot 6-2, 7-5 and will next meet Julien Benneteau, who beat Marcel Granollers 6-3, 3-6, 6-2. Fernando dropped serve twice in the first set but didn't face another break point. 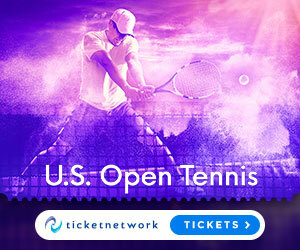 "I've got to the final here before, so it's one of my favorite tournaments," said Verdasco. 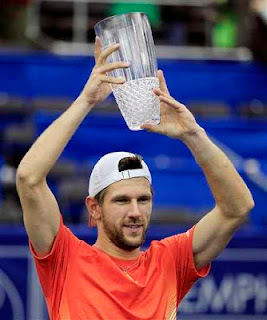 Jurgen Melzer won the 2012 Regions Morgan Keegan Championships title after defeating Milos Raonic of Canada 7-5, 7-6. Melzer broke Raonic to go up 6-5 in the first set and then served out to win the first set, finishing with a 108 mph ace. Raonic needed four break points before breaking Melzer go up 3-1 in the second set. The Canadian held serve for a 4-1 lead before Melzer broke back when Raonic double-faulted to give the Austrian the advantage and then hit a forehand into the net. Still, Raonic had set point at 30-40 leading 5-4 when Melzer double-faulted but he was not able to take it. Jurgen Melzer defeated Igor Kunitsyn 6-2, 6-7 (3), 6-4, 3-6, 6-1 to give Austria a 1-0 lead against Russia in the first round of the Davis Cup. Melzer closed out the victory with his 23rd ace after just over four hours of play. He had more than 80 winners as he overpowered Kunitsyn. Russia captain Shamil Tarpischev had unexpectedly picked Kunitsyn instead of Mikhail Youzhny. Mardy Fish beat Jurgen Melzer 6-2, 4-6, 6-1 to move into the final of the Kooyong invitational tournament against Bernard Tomic. Fish has won twice at the exhibition tournament that is a traditional warmup for the Australian Open, which begins Monday at Melbourne Park. Tomic beat Gael Monfils to reach the final. Jo-Wilfried Tsonga lost 6-4, 6-3 to Austria’s Jurgen Melzer while Mardy Fish beat Milos Raonic 61 62 at the invitational Kooyong Classic. Cold, blustery conditions made it difficult for players. Raonic withdrew from the eight-man tournament after the loss, citing an upset stomach. It looks like the rumors that started at Wimbledon, while they were playing mixed doubles together, were true. Iveta Benesova is officially dating tennis ATP Tour player, Jurgen Melzer. The story tells that Melzer broke up with his girlfriend, Mirna Jukic, just a few days after he and Benesova won the title at the All England club because Mirna didn´t like the chemistry between her then-boyfriend and still the pretty Czech. Melzer, who also dated Anastasia Myskina (who is now pregnant, again), Nicole Vaidisova and Dominika Cibulkova, was spotted with Benesova in Basel last week. Jurgen Melzer has pulled out of the Swiss Indoors in Basel and the Paris Masters because of a back injury, ending his singles season and placing his participation in the doubles at next month’s season-ending ATP Finals in London in doubt. Leitgeb said Melzer would “probably not” recover in time for the Nov. 20-27 London event. Jo-Wilfried Tsonga reached the quarterfinals of the Erste Bank Open after Jarkko Nieminen pulled out with a right thigh injury while the Frenchman was leading 3-6, 6-1, 3-1. Jurgen Melzer scored a 7-5, 6-1 win over Guillermo Garcia-Lopez to also advance. Tsonga dropped his first service game to go 3-0 down and scored only five points against Nieminen’s serve in the opening set. But the Frenchman soon took control of the match with two breaks in the second set, hitting 14 aces in total. Jurgen Melzer defeated Rik de Voest 6-0, 6-4 to advanced to the quarterfinals at the Malaysian Open. Melzer broke De Voest’s serve four times at Putra Stadium. Dmitry Tursunov beat David Goffin 6-3, 6-3 in the second round while Marcos Baghdatis also advanced after beating Somdev Devvarman 7-5, 6-4. Jurgen Melzer and Philipp Petzschner beat Mariusz Fyrstenberg and Marcin Matkowski 6-2, 6-2 to win the US Open 2011 title. "From the word go, we were playing really well," said Melzer. "The opponents were a little bit nervous from the beginning and we fully used that to our advantage." Petzschner added, "Winning another slam is an amazing feeling. We're both really happy the way it turned out." The doubles final did not get underway until close to midnight, but it did not throw Melzer and Petzschner off their game. The ninth seeds went up a double break inside five minutes, with Petzschner scorching returns and the under-fire Poles both double faulting. Petzschner closed out the set on serve in the eighth game after 22 minutes. Jurgen Melzer has been eliminated in the second round at the Winston-Salem Open by Igor Andreev 7-5, 6-3. Melzer had trouble catching up to Andreev’s serves, some of which were clocked at 125 mph. Andreev, who won points on 77 percent of his first serves, is ranked 79th in the ATP rankings and entered 0-2 against top-five opponents this season. Marcos Baghdatis defeated Ryan Sweeting 7-5, 6-1 in another second-round match. “I was able to find a solution to get by and win. 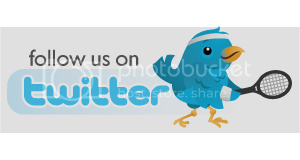 That’s the most important thing,” Baghdatis said. Kei Nishikori beat Gilles Muller 1-6, 6-4, 7-6 (5) in the first round. Dudi Sela defeated Filippo Volandri 6-3, 6-2; Steve Darcis topped Frederico Gil 3-6, 6-3, 6-4; Julien Benneteau won a matchup of qualifiers by defeating Ricardo Mello 6-1, 6-3; and Carlos Berlocq advanced when Andreas Haider-Maurer retired with Berlocq leading 7-5, 4-1. In season 3, episode 29, ATP World Tour Uncovered profiles Austrian No. 1 Jurgen Melzer. Gael Monfils beat Albert Ramos 6-4, 6-2 to advance to the bet-at-home Open - German Tennis Championships 2011. The Frenchman won 75% of his service points and saved all five break points he faced. 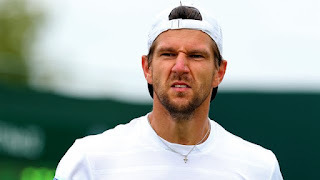 Jurgen Melzer also advanced after defeating Daniel Gimeno-Traver 6-3, 5-7, 6-1 while Nicolas Almagro beat Lukas Rosol 6-4, 6-4 in 77 minutes. Florian Mayer made it past Marsel Ilhan 6-4, 7-6 and Fernando Verdasco knocked out Pablo Andujar, 6-2, 6-3 in 86 minutes. Marin Cilic beat Bastian Knittel 6-3, 6-7(4), 6-4 in three hours. The Croat hit 16 aces and won 66% of his service points and saved 10 of 12 break points. Juan Monaco dropped 12 points on his serve to beat Janko Tipsarevic 6-2, 6-4. Radek Stepanek converted all five of his break point to defeat Andreas Seppi 6-1, 7-5 in 89 minutes. Q. Next round it's Xavier Malisse. What do you know about him? What do you expect? JURGEN MELZER: Well, I expect a tough match. He knows how to play on grass; former semi-finalist here. I think we have had two matches. I'm not sure. It's been a long three maybe? Okay. It's been a long time ago. JURGEN MELZER: Chennai, I lost to him in Chennai. It's going to be a tough match, completely different than the one I had today, I think. Xavier plays the ball. He's not hitting as hard as Tursunov. I'm actually looking forward to play tennis because today it felt like it's a little more goalkeeping and guessing which side to go. But I'm positive. I mean, I've played I haven't played a lot of matches lately, and I still beat a good opponent today with Tursunov. I'm happy with my performance. As I said, I'm very much looking forward to the match. JURGEN MELZER: Probably. I mean, if you consider the rankings I might be the favourite; if you consider that I haven't played any matches almost since Rome, then it could be an even match. Q. Why haven't you played since Rome? JURGEN MELZER: Well, I have played, but I have been injured on my back. Q. And you are 100% okay? JURGEN MELZER: I'm 100% fine, yeah.